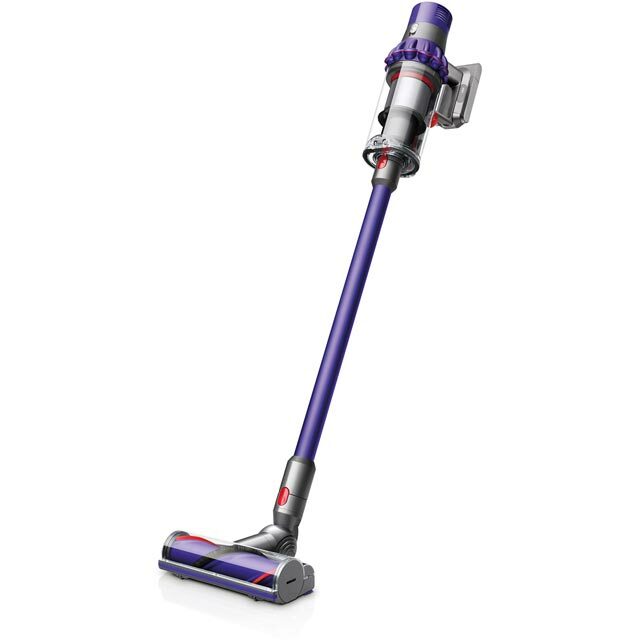 Leave your whole home spotless with this cordless vacuum from Dyson. As it has a generous 60 minute run time, you can give your rooms a really thorough clean. The powerful direct drive cleaner head works deep into carpets fibres, lifting out ground-in dirt. It also has a mini motorised tool that’s perfect for pet owners, as it effortlessly picks up hair from floors and upholstery, like sofa cushions. You’ll never need to get your hands dirty either, thanks to the hygienic bin emptying system – simply push the slider to open it and remove the debris. You don’t need to remember to charge it either, as the handy docking station does it automatically, so it’s always ready for action. With this model’s fantastic run time, you can enjoy incredible performance for longer. Thanks to its powerful battery, each charge gives you up to 60 minutes of outstanding suction, without it weakening. This means there’s plenty of time to give your whole home a really thorough clean, so you can easily leave every room completely spotless. Thanks to the Dyson Digital Motor V10, you can enjoy incredible performance without the weighty vacuum. Its clever design makes it spin much faster than others to create greater suction – and it’s lightweight too. This means it’ll give you great performance in a small package, letting you effortlessly tackle those big cleaning jobs. You can always enjoy uninterrupted cleaning thanks to this model’s large dustbin. Because of its clever design, it’s 40% bigger than other models’, yet doesn’t add much bulk to the vacuum. This means you can leave every inch of your home looking spotless without taking extra trips to the bin. You’ll have no trouble getting rid of ground-in dirt thanks to this model’s brilliant direct-drive cleaner head. With a greater brush bar power than other cleaner heads, the bristles will reach further into carpets. This means it can easily pick up dust and debris that’s stuck deep in the fibres, leaving your floors beautifully clean. For more effective cleaning, this model has Dyson’s clever Cyclone Technology. By channelling air more efficiently through smaller cyclones, suction is increased and maintained to pick up every last allergen and bit of debris – even those microscopic dust and dirt particles. This means it’ll give incredible results on every carpet and rug, so your home gets a deeper clean. Over the moon with our Dyson. It cleans fantastically well, is light, easy to manoeuvre and get into awkward places like under furniture and around corners. Keeping it on a low setting is perfect for hard floors and makes the battery last longer. Super lightweight for carrying upstairs. Best thing we’ve ever bought. Highly recommended. This is a fantastic Hoover with great suction . It’s so easy to lift it off the dock for a quick hoover , no messing with the cord. Would recommend. The cordless vacuum is excellent in terms of quality of build and range of fittings to cater for every eventuality. The motor is powerful and the suction is brilliant. I would recommend it to anyone who can afford the relatively high price as it is worth the money. The only problem I have encountered is that my dog goes nuts at the whine of the motor or sound of the suction but has never reacted to any other vacuum cleaner in the same way. Decided to upgrade my V5 and I wish I had done it sooner. Absolutely love the V10. I’ve got 3 kids and 3 dogs and the V10 powers through the whole house in no time at all. Absolutely love it.